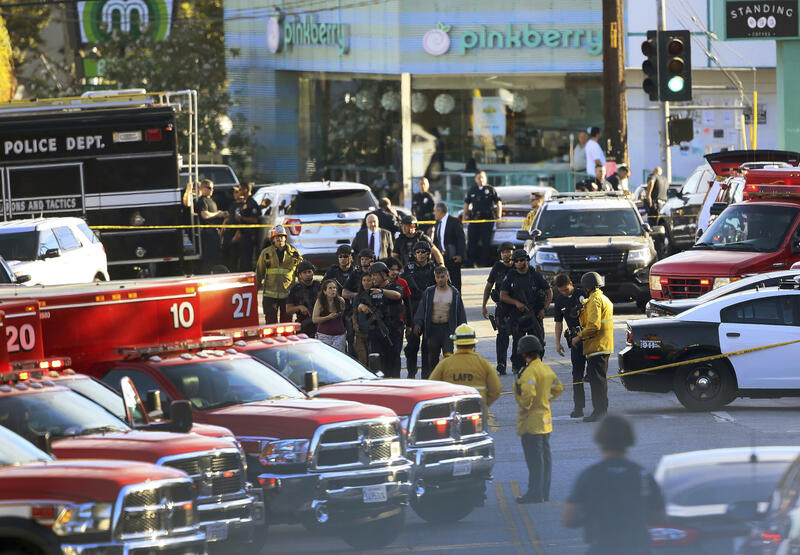 LOS ANGELES -- A gunman who got into a deadly shootout with police, then took dozens of people hostage at a Trader Joe's supermarket in Los Angeles' Silver Lake has been arrested on suspicion of murder, authorities said Sunday. Gene Evin Atkins, 28, was being held Sunday morning on $2 million bail, police said. It wasn't clear if he had an attorney. A message left at a number listed for Atkins in public records wasn't immediately returned. A woman was shot and killed when Atkins ran into the supermarket on Saturday, but no hostages were seriously hurt before the man handcuffed himself and surrendered about three hours later, police said. The driver got out, and police started firing at him as he ran toward the supermarket. Kohles hurried inside, and he and others took cover as the man ran in. "Those bullets went right over the back of me as he was running right down the main aisle," Kohles said. Christian Dunlop, a real estate agent and actor who lives nearby and frequents Trader Joe's, was on a corner near the store when he saw four people run out. One person, an employee, was dragging an injured woman by the hands. "She appeared lifeless," Dunlop said. President Trump tweeted Saturday that he was watching the situation "very closely," but later deleted the tweet.